My son Thomas and his wife live in Seattle and there is a cupcake shop there called Cupcake Royale. They LOVE cupcakes and even bought me a shirt from the shop for my birthday one year. Recently, they were home for a quick visit and we met them at the Woodstock Cafe for lunch before they flew home. Herb’s birthday had been the week before and since we can no longer celebrate birthdays together, I thought it would be a fun treat for all of us to have personalized cupcake pots with chocolate cupcakes in them at the Cafe for dessert. Thomas is following in his dad’s curmudgeon footsteps, apparently, and is known at his workplace as the Grumpy Cat and even uses an illustration of the Grumpy Cat as his Google profile image, so it was only fitting to make his cup with the Grumpy Cat on it. 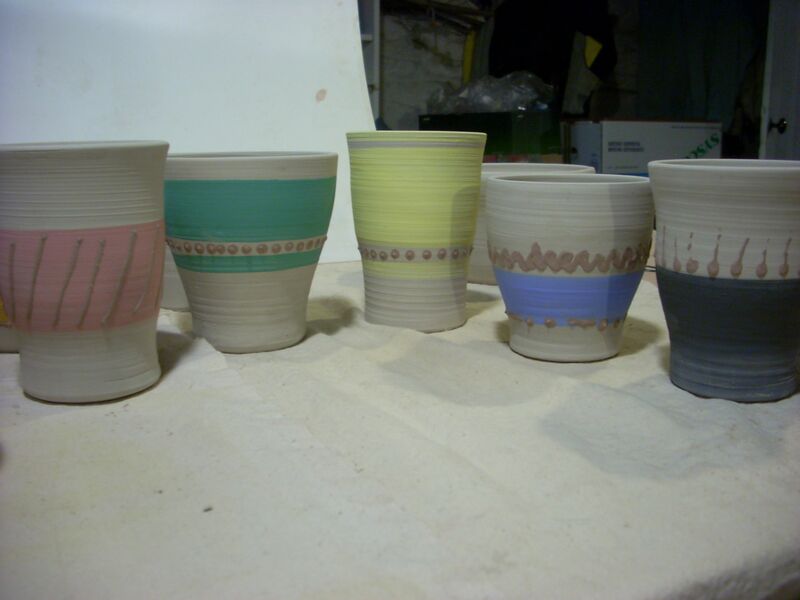 Each pot was different and were super simple to make. I went to Smitten Kitchen’s site and found a recipe called the “I want Chocolate Cake” Cake recipe and it is great because it only makes enough for an 8 X 8 pan of cake, which filled 6 cupcake pots. 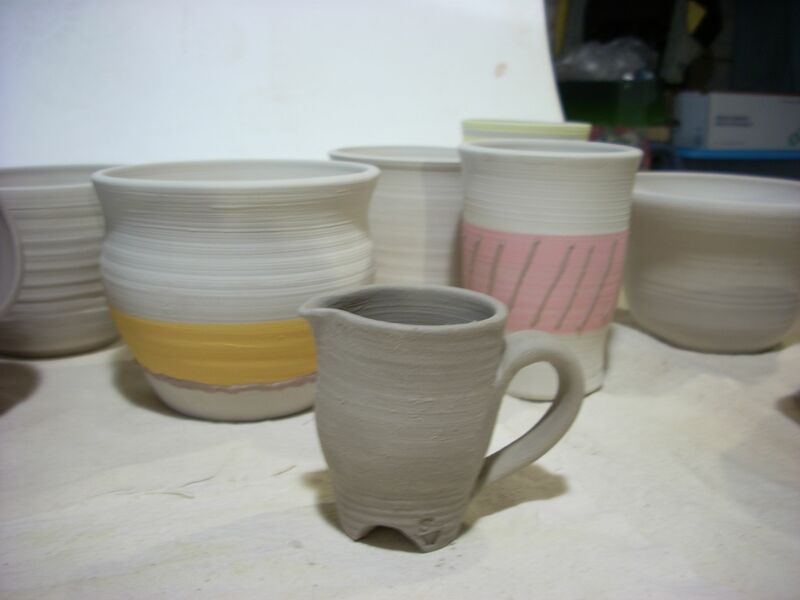 The remainder of the cups are listed on my Etsy site and I have 8 more in the kiln that are to be glazed. The idea is to make a special cupcake for that co-worker or birthday someone and they receive their cupcake in the pottery cup and everyone else gets the cupcake in the paper liner. It provides a simple and inexpensive gift and takes cupcakes to a new level. We didn’t even light our candles at the Cafe…. I did mention the curmudgeon thing, didn’t I? But, the cupcakes were a hit and hopefully they are now being used in Seattle for ice cream or to hold M&Ms or something as a reminder of our short time together. It is always good to see them both. I have a cupcake kit from the past. Last year, Herb had me make some of his teacher friends, who were expecting, a baby’s first bowl as a special gift for their new baby. I had a lot of fun with them and sold all of them as they were a huge hit. So, I decided to have a few of them on hand for the Holiday Open House on Sunday and so I am sharing those with you today. They are really small but really sweet and as the child grows, they can begin as a bowl for cereal and applesauce and evolve into a snack bowl for cheerios or m&ms and raisins or peanuts. I have six of them. We will see how they are received. 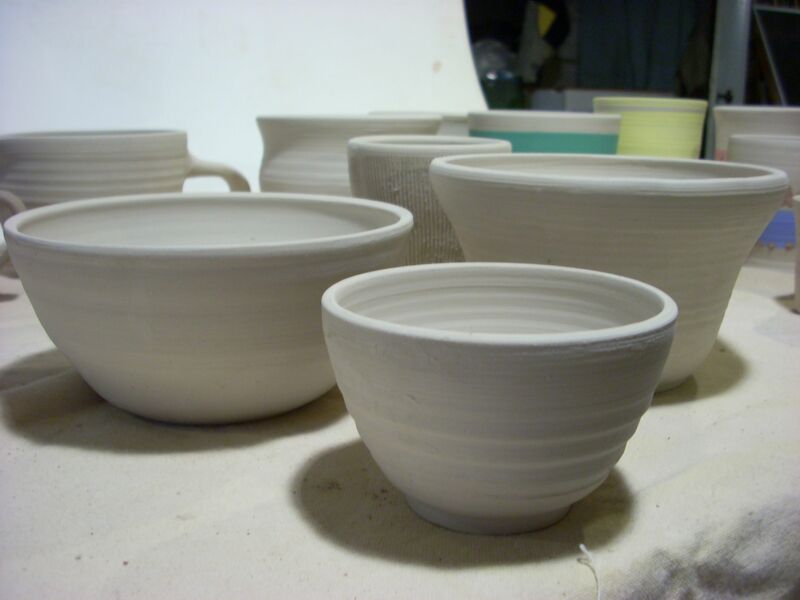 I am just sharing some of the frog bowls that I have been working on for the holiday season. I am not putting them up on Etsy for sale just yet because I need to have them available to my local customers for my Open House the first of December. 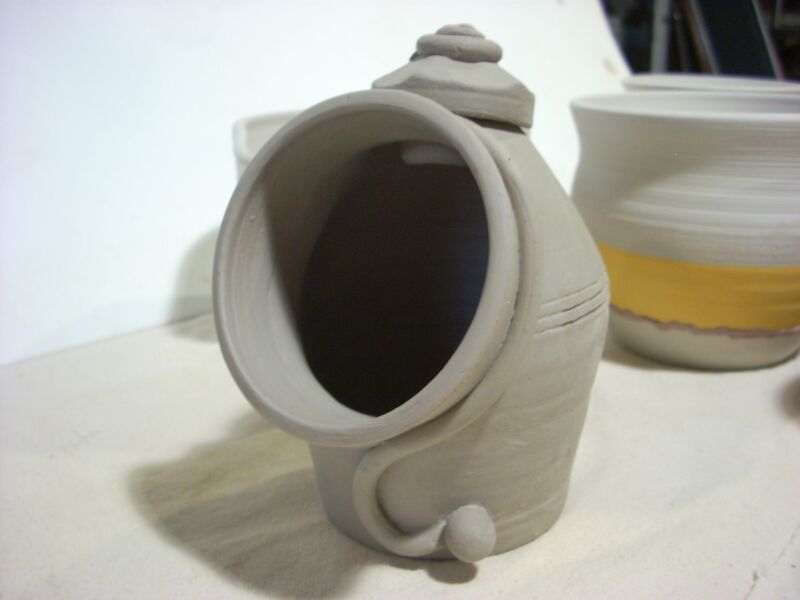 Oh, and I have a teapot in the works… check out the photo of it. It is still in clay form but will be getting fired soon and glazed. I’m pleased with how it turned out. Trying to build an inventory of work can be challenging when I have to take the entire process into account. Time is spent photographing the images and then getting those images ready for the web. All those years of color correcting photos in the digital printing world has helped me out in this regard but it is still time consuming to go through and edit and cull out about 5 images per item. Etsy allows me to upload 5 images of the items and I usually try and shoot more than that with several views. The thing about uploading a photo to the web is that not everyone’s monitors are calibrated to mine so they may order an item and it doesn’t really look like the photo when it arrives at their house. When I worked in printing and we would hear the customer say, “but it doesn’t look like that on MY monitor”, we always wanted to say that we would just ship their readers a monitor instead of the printed piece. Things almost always look better on a monitor before it is printed. 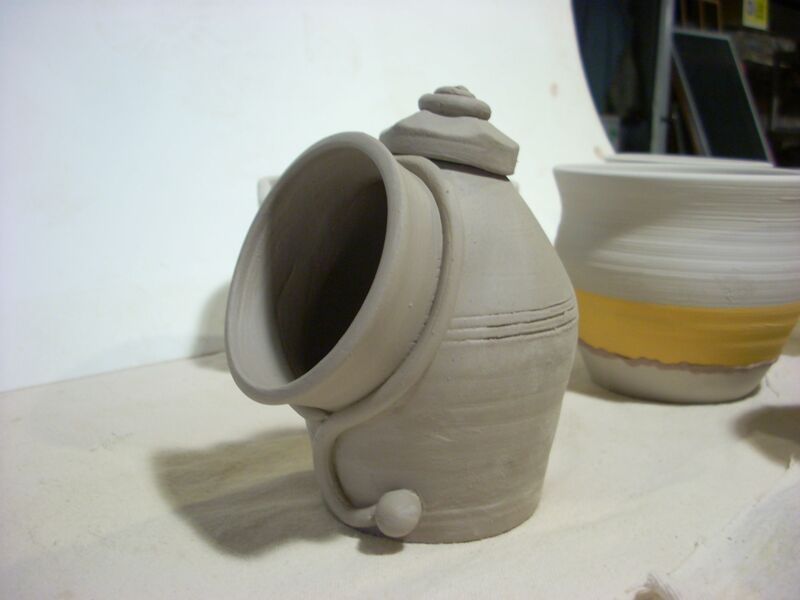 However, with pottery, I think that the real thing tends to look better than the photo uploaded to the web. The background that I have been using is a vignetted gray blend so I usually try to get that gray to look like gray and by doing that the rest of the colors should fall into place. It is easier said than done sometimes though, but it at least gives a balanced base. If you are interested in reading a post on how to photograph work, I can certainly do that in the future. 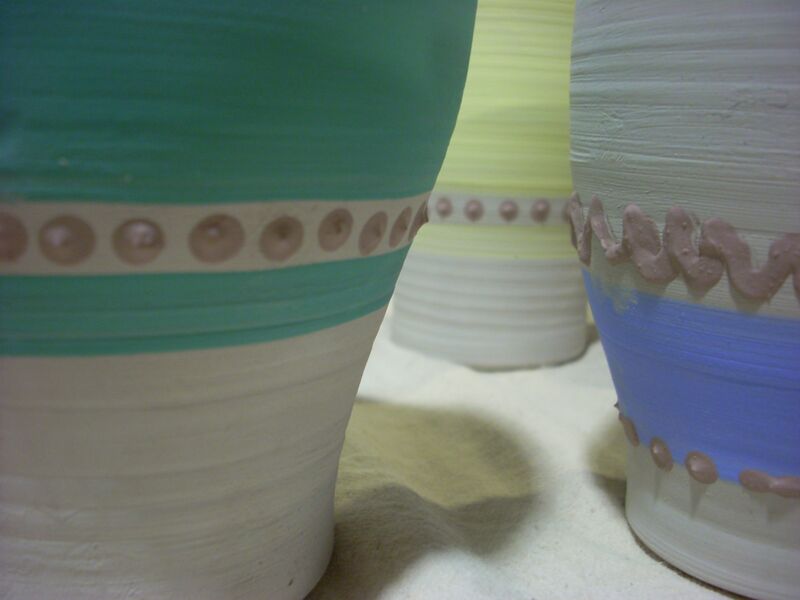 Now you can see the finished product from the how to post on putting the decoration on the cups. I will be adding all these items to Etsy very soon but I thought I’d do a preview here first. Look for these items to go onto Etsy tonight or tomorrow and if you are interested in them you can find them here. As you can see, I have been busy with my new wheel that Herb bought me for Christmas. I am trying out new shapes and basically, just trying to get used to what my hands are supposed to do. I have two different colors of clay. They are both stoneware, a white and a chocolate brown. 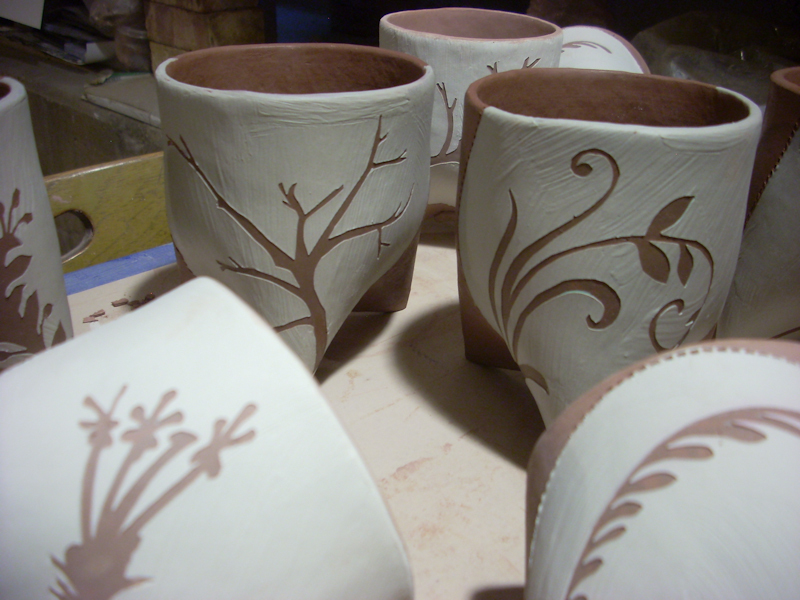 I played with the white clay first and made a slip out of the brown and trailed it on some of the cups and a bowl to see how that will look. 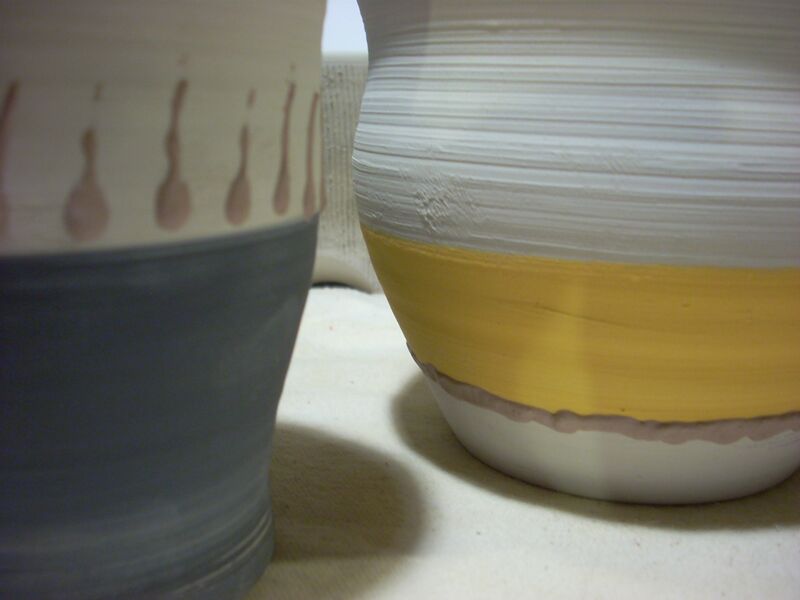 The colored bands are just an underglaze. I need to work on getting my shapes consistent. 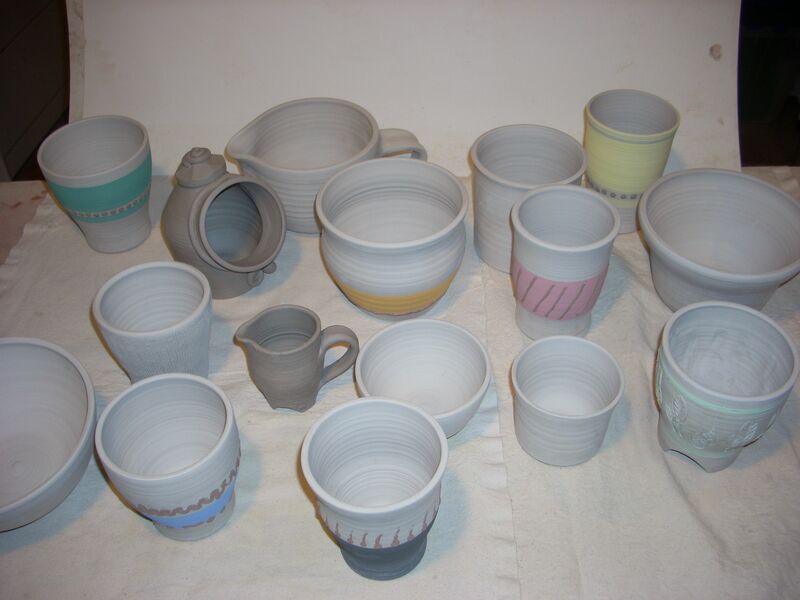 These cups all started out basically the same size clay ball and as you can see they are nothing alike. I have ordered a scale so that I can weigh the balls before I start so that they are at least all the same weight. That still doesn’t mean they will all turn out the same. And I had to try a batter bowl. The handle is too big and clunky but it was my first handle after so many years. Practice will help those. This is just a group shot of everything I have gotten off the wheel so far. 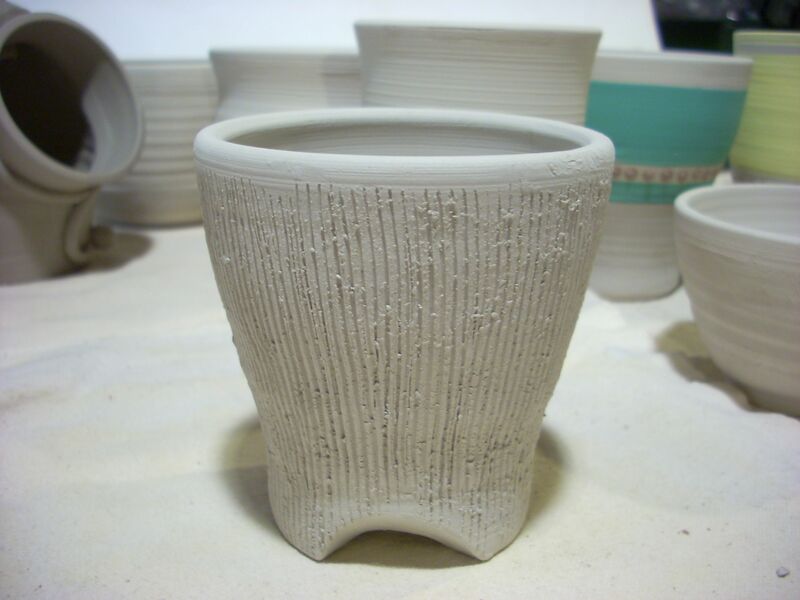 I tried to make a footed cup. I saw this technique on Lucy Fagella’s how to page and I like the look. The foot is trimmed and then you eyeball the three feet and slice the leather hard clay to form the feet. 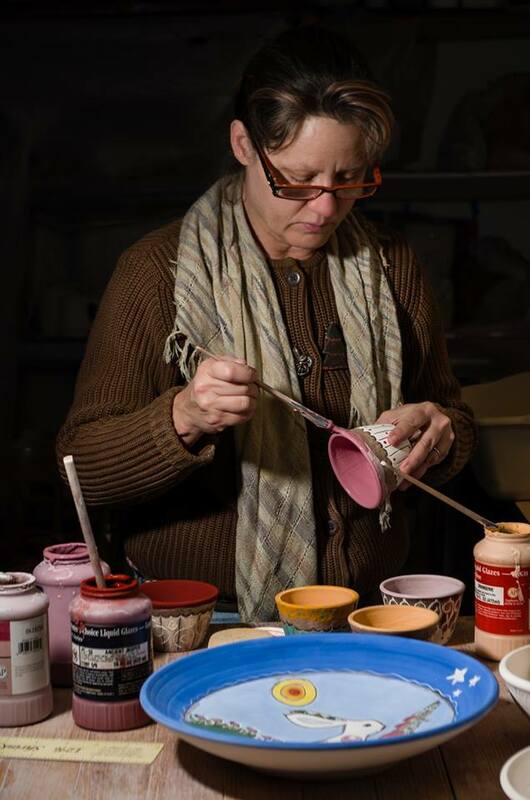 You make the bottom of the pot heavy on purpose, which is easy for me right now, and then you have enough clay to work with. I like the look. She used a lemon zester to put her pattern in the sides. I had a serrated rib that I used for mine. It gave it a nice texture to grip. And I have the Glenn Nelson Ceramic books from the old days and browsing through them I came across an interesting salt cellar that is thrown in two parts and assembled. I threw a cone shape for the main body. (I didn’t think this through because the top was so tiny, I had to put it inside another piece to center on the wheel to trim the bottom, that was hard) I made a small lid to fit into the top hole and then threw a small shallow bowl, which I cut the bottom out of for the large opening on the side. The seam was very thin so I decided to reinforce it with a coil around the opening for decoration and to give it some strength. And a side view of the salt cellar. 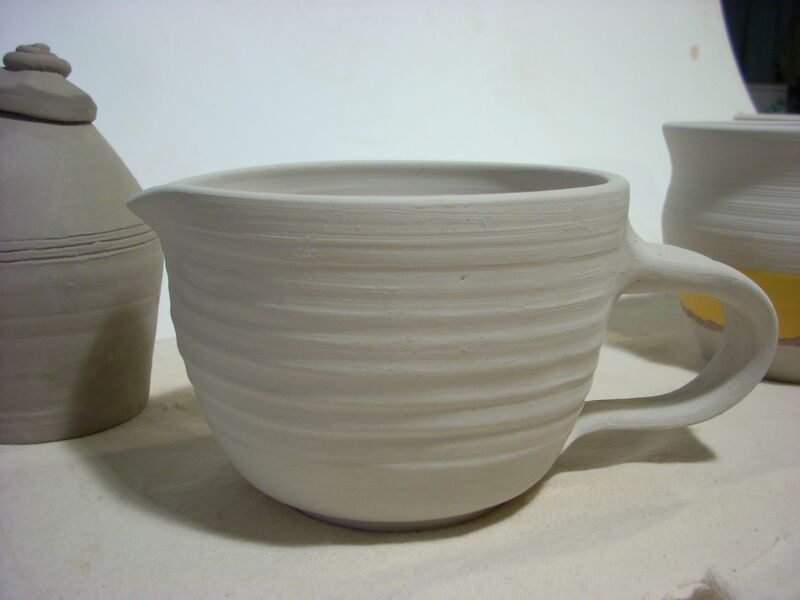 And finally, a small pitcher for cream or syrup. I did the three footed bottom on this little guy and had a better success with the handle. It seems to have a tipsy attitude on the handle side. I’m hoping that the liquid inside will counter balance this problem. So, I feel pretty good about the first attempt. We took a trip to Manassas Clay yesterday and seeing some of the amateur pottery in the shop made me feel like I am doing okay. Of course, now I have to glaze them and that is another round of weeding out the bad and keeping the good. We’ll see who is standing in the end.